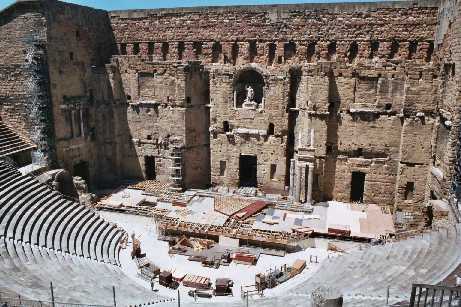 The Roman Theatre at Orange. Participation by prior arrangement only - please email the Branch to ask for more details. Nigel Coulton is co-ordinating. Led as usual by Dr Andy Fear. We will visit the Rollright Stones and the Ashmolean Museum in Oxford, with time for individual exploration also in the city. For this event, which will conclude with a canal side evening meal in Warwickshire, there is a charge of 25 pounds, which this year we have to ask to be paid in advance, to ensure the cost of the coach will be fully met. April 2019: Delighted to report we now have sufficient firm bookings with payment to confirm that the Oxford coach trip will take place as planned on 18th May. This means we are still open for other bookings until the end of April at least. Please note the coach will depart at 8.00 a.m. The booking form may be downloaded here. Greek A Greek Reading Group meets at a private house on Keele campus every four weeks or so, generally on a midweek morning. The group is reading texts from the Perseus Digital Library. Meetings recently recommenced, and are now continuing with Nigel Coulton as organiser for the present. Next meeting Thursday 16 May 2019, at 10.00 a.m., when the Group will continue reading Odyssey III from line 151, in a member's house. Some prior knowledge of Greek is required, but the atmosphere is relaxed and support is provided. The next work will be Ancient Greek Epigrams ed. C.T.Hadavas ISBN 9781727440225. Latin The Latin Reading Group also meets about monthly, usually on a weekday morning on the second Monday of the month, on Keele campus. The next meeting will be in a private house on Keele campus, at 10.00 a.m. on Monday 6 May 2019. The group will continue reading selections of Ovid's Metamorphoses, Io and Syrinx (Jones page 63, line 61 interea medios Iuno........., and will also be looking at the Nuntii Latini news from Radio Helsinki, which is updated every Friday. For further details of both groups, or for anyone new wishing to join the groups, please contact the organiser, Nigel Coulton, tel: 01782-615155, or email the Branch address below. These groups are not for beginners: some prior knowledge of the relevant language is necessary to take part in either. For both, please ask the organiser if there is room in the group for more members before joining. Beginners Latin from Scratch: a weekly Group is also now available, strictly limited to 5 members. Contact Nigel Coulton if interested. The group began its course on Tuesday mornings in March 2016. It now meets on Thursdays. This scratch group has now progressed too far to integrate further beginners, but Nigel is willing to begin another scratch group if there is the demand. Please let us (email below) know if you would be interested. The only requirement would be that if not already a subscribing member you became one. The Branch is pleased to say that, through the generosity of the Hellenic Society, we hold a copy of the board game Pots! The Game, suitable for age 10 and upwards. This is available to be borrowed at no charge by Schools in our area, and is a fast paced game for 3 - 6 players, bidding against each other to acquire the biggest and best collection of Greek vases. The Hellenic Society has made it available as part of its own Schools Programme since, as well as being good fun and instilling a general interest in Greece, the game has useful images and details of Greek vases in the British Museum. It should be of particular interest to any school students looking at Greek Art modules, but could also be used with older Minimus groups, to extend their interest to Greece as well as Rome. Interested schools can request a loan at the termly meeting above, or direct from this Branch (below).